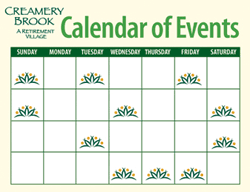 Enjoy three expertly prepared meals per day as part of the Assisted Lifestyles at Creamery Brook Village. Start your day with a hearty breakfast with friends, enjoy lunch before the afternoon shopping trip and a seasonally-inspired dinner in the warm and inviting full-service dining room. Food is expertly prepared by our Executive Chef using fresh seasonal and locally-sourced ingredients, including fresh-picked seasonings from an on-site herb garden. 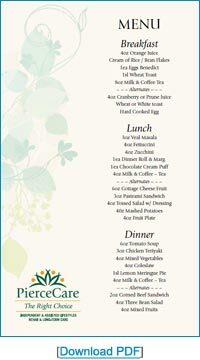 Menus change frequently to include an inspired selection of nutritionally balanced, healthy options and familiar favorites. For a continental breakfast or a casual snack enjoy our Coffee Nook, available all-day and serves as a gathering place to catch up with neighbors and the day’s news.